If there is any one food type that I like more than the rest it’s ice cream; nothing screams out dessert to me quite like a bowl of the frozen kind. Needless to say when I dusted off my ice cream maker after the move, and realized it had been a 2 years since it churned out anything; I was aghast. Despite the fact that I do my best to ingest lean food I have a separate stomach and conscience for frozen heavy cream and years is far to long to go between batches. 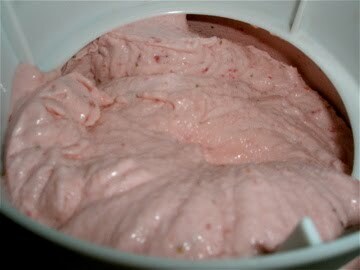 The Strawberry Ice Cream that I ended up making was the result of intense research much like the pollo adobado recipe. While I had originally set out to make peach ice cream I arrived at the store to find the fury beasts covered in squishy bruises and that’s when god shined his light on those luscious berries. This brings me to a very important point: when making ice cream be a grocery snob. Support your nearest overpriced WF or farmers market and pick up some pristine produce. WHY? because you won’t have the benefit of loads of spice or intense heat to improve the flavor of your confection. If you put in quality that’s what you’ll get and if you put in ugly spotted peaches you get ugly ice cream. So although the strawberries had a rather serendipitous role in the whole affair they were the perfect alternative to peaches. I made a custard based ice cream and generally favor this cooking method for all my frozen treats no matter the flavor. If you do a little research you’ll find that there are many ice creams that rely solely on milk fat, but the resultant texture is a little icy and in my opinion less tasty than those recipes that include eggs (think Breyers vs. Ben and Jerry’s). Another thing worth mentioning is that among egg containing ice creams some call for raw eggs, which to me is an example of unnecessary risk; bacterial phages still phase me. To knock those pesky microbes out all you have to do is pasturize the eggs; which is how this recipe is made. So go grab some waffle cones and get to it! The sizzling temps outside are all the more reason to indulge in this cool treat. Beat together the eggs in a medium sized bowl, set aside. 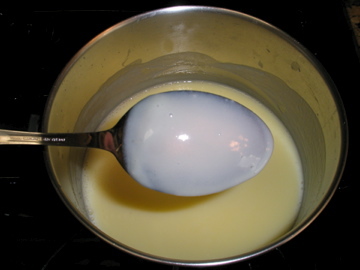 In a saucepan heat the milk and 1 cup of the heavy cream over low heat stirring occasionally until hot but not boiling. Add the sugar and salt, and stir to dissolve. Take a 1/2 cup of the hot mixture and slowly add it to the eggs, stirring continuously to bring the eggs up to the temperature of the milk without poaching them. Next add the egg mixture into the saucepan with the milk and cook over low heat, stirring continuously for 7-10 minuets to pasteurize the eggs. Once the mixture is thick enough to coat the back of a spoon (see last photo) turn off the heat and pour the custard into a re-sealable container. Refrigerate for 2-12 hours. 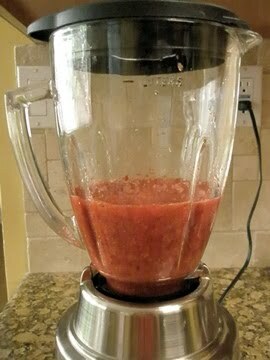 Puree strawberries in a food processor to yield ~3 cups. Add this to the custard along with the remaining 1 cup of heavy cream and vanilla and stir to combine. If you have an ice cream maker proceed according to manufacturer’s directions. Store in freezer for up to 2 months, good luck making it last that long.